Auralie Shapiro, Remote Sensing Specialist in the Conservation Science Program, talks about how GIS and remote sensing are used to study land use change, migration patterns, and natural threats to species to facilitate conservation efforts. Declining groundwater in Mississippi has prompted a $1 billion lawsuit against Memphis. Although declining streamflows and half-full reservoirs have gotten most of the attention in water conflicts around the United States, some of the worst battles of the next century may be over groundwater, experts say – a critical resource often taken for granted until it begins to run out. Aquifers are being depleted much faster than they are being replenished in many places, wells are drying up, massive lawsuits are already erupting and the problems have barely begun. Aquifers that took thousands of years to fill are being drained in decades, placing both agricultural and urban uses in peril. Groundwater that supplies drinking water for half the world’s population is now in jeopardy. A new analysis by researchers at Oregon State University outlines the scope of this problem, but also points out that some tools may be available to help address it, in part by borrowing heavily from lessons learned the hard way by the oil industry. Water laws, Jarvis said, are often part of the problem instead of the solution. A “rule of capture” that dates to Roman times often gives people the right to pump and use anything beneath their land, whether it’s oil or water. That’s somewhat addressed by the “first in time, first in right” concept that forms the basis of most water law in the West, but proving that someone’s well many miles away interferes with your aquifer or stream flow is often difficult or impossible. And there are 14 million wells just in the United States, tapping aquifers that routinely cross state and even national boundaries. “For decades, climate scientists have worked to identify and measure key substances — notably greenhouse gases and aerosol particles — that affect Earth’s climate. And they’ve been aided by ever more sophisticated computer models that make estimating the relative impact of each type of pollutant more reliable. “Yet the complexity of nature — and the models used to quantify it — continues to serve up surprises. The most recent? Certain gases that cause warming are so closely linked with the production of aerosols that the emissions of one type of pollutant can indirectly affect the quantity of the other. 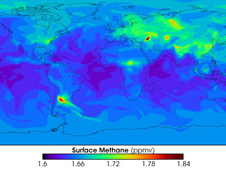 And for two key gases that cause warming, these so-called “gas-aerosol interactions” can amplify their impact. “The Centre for Ecology & Hydrology (CEH), part of the Natural Environment Research Council (NERC), is the UK’s Centre of Excellence for research in the terrestrial and freshwater environmental sciences. Its science is delivered through three interdependent science programmes – Biodiversity, Water and Biogeochemistry – with an integrated framework for data management provided by the newly established Environmental Information Data Centre (EIDC). Maintaining the Southeastern Watershed Forum data server and provides limited support for their efforts. Working toward the development of a City of Chattanooga greenprinting website to share information with policy and decisions makers. Launching the Herbarium Web Server – write scripts and add Boolean descriptors toward ability to multiquery data, create “cookie” like maps of common queries to speed web server queries for users or develop a script to accomplish this same goal, add corrected GBIF data to database so that a large database can be queried, and launch web server to complete the proof the concept that the large biological datasets can be hosted and searched within a GIS framework (possibly linking this with the SEWF portal). Generate a Green Infrastructure and Sustainability Model for the greater Chattanooga Metropolitan Area with a discussion board to generate communication and networking among greenprinting players. May require travel to further UTC/NBII relationships and promote work being done at UTC. B. S. in Computer related technology or science; or B. S. in Biological or Environmental Science; or B. S. in Business Management or Finance. Demonstrated ability to combine GIS (e.g. Arc) with Computer Programming (e.g. Java scripting, Python, Visual Basic), web design/maintenance/monitoring, and remote sensing (e.g. Lecia photogrammetry suite, Erdas-imagine, AUTO-sync) and GPS (e.g. Trimble GPS suite and Arc Pad) technologies. Send cover letter, application, resume, transcript of the last degree awarded, along with names, addresses, and telephone numbers of three professional references to: UTC Office of Human Resources, Dept 3603, 615 McCallie Avenue, Chattanooga, TN 37403. New blog post from the GIS Education Community: Exploring Data Using Cartograms within ArcGIS Desktop at the County and State Scale.